Input text: a 20 feet high and 25 feet deep and 25 feet wide solid black rock is 5 feet in the ground. the ground is black. a 20 feet tall solid black 1st dodo is -12 feet above the rock. a 19.986 feet tall 2nd dodo is -19.99 feet above and -10.024 feet left of the 1st dodo. the camera light is black. it is noon. a 1st white light is 1 feet right of and 1 feet above and -8 feet in front of the 1st dodo. a 2nd white light is 15 feet left of and 10 feet in front of the dodo. the 2nd white light is above the ground. 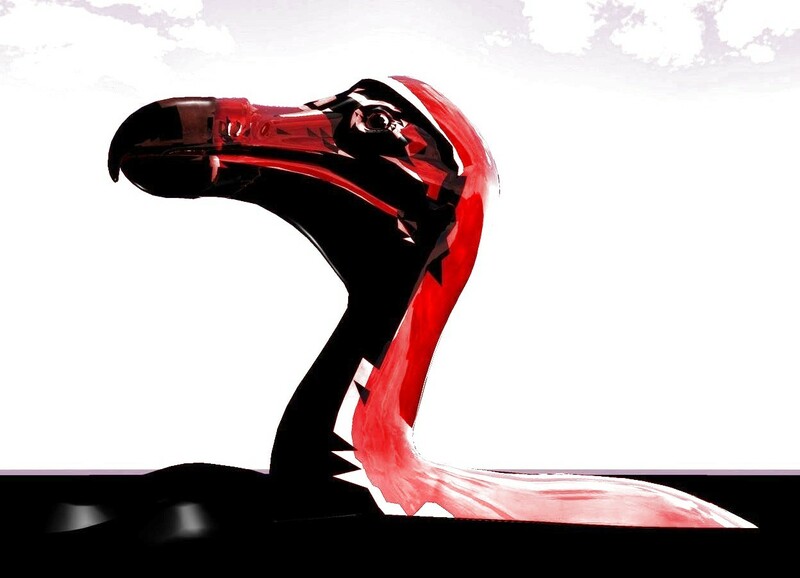 a 19.96 feet tall and 10 feet wide and 17 feet deep 3rd translucent red dodo is -19.92 feet above and -10.09 feet left of the 2nd dodo. the ambient light is red. complete with paint....so tribal ! !